“but standing by the cross of Jesus were his mother and his mother’s sister, Mary the wife of Clopas, and Mary Magdalene. When Jesus saw his mother and the disciple whom he loved standing nearby, he said to his mother, “Woman, behold, your son!” Then he said to the disciple, “Behold, your mother!” And from that hour the disciple took her to his own home. The Lenten season can be a time of deep spiritual reflection. This sermon series has been instrumental in helping focus my own understanding of how to embrace a compassionate lifestyle in a 2019 world in which the fundamental struggles resemble the world in Jesus’ day. Our national culture is immersed in anger, fear, self-centeredness, hatred, and greed. And, if this doesn’t sound familiar, maybe you’ve entertained a conversation about politics with only yourself. With both arms wide-open, Jesus stepped into the timely, radical conversations with some of the most politically-charged, fearful, and angered people in His day. As we have reflected on Jesus’ interactions in the garden of Gethsemane, judgment by Caiaphas, betrayal by Judas, and back-stabbing by Peter, I was pleasantly surprised that we ended this worship series reflecting on Jesus’ relationship with His own mother. Mary’s relationship as a mother was potentially a perilous relationship in the sense that she was guilty by her association with Jesus. In the first century, women were less-than citizens who were marginalized beyond comprehension. And yet we have the documented accounts that Mary is at the foot of the cross with John watching her Son die. I am amazed by the courage and strength all by Mary’s willingness to stand there. I can only imagine that she was mocked and possibly threatened to have her life taken. We know that Mary was part of Jesus’ “in-crowd” ministry and was well aware of His mission. But her very own life was not unscathed. While Jesus walked to His death, His disciples hid. John was the exception, and Mary and John stood at the bottom of the cross, like any loyal friend and parent does, by never abandoning the ones they love. Compassion is typically defined as sympathetic pity and concern for the sufferings or misfortunes of others. Through this example, we can learn the application of compassion. 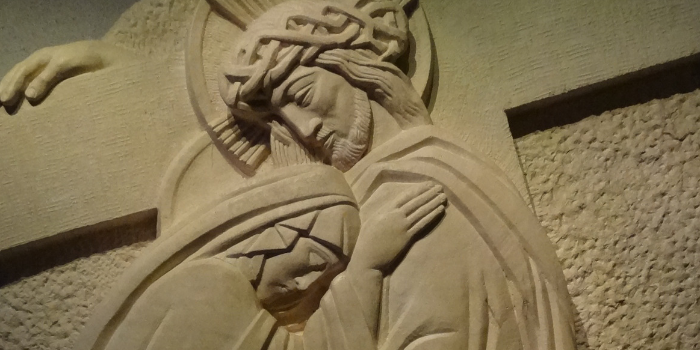 Thankfully, we have a window of history to see through and meditate on the relationship between Jesus and Mary. May God bless you with a restless discomfort about easy answers, half-truths, and superficial relationships, so that you may seek truth boldly and love deep within your heart. May God bless you with anger at injustice, oppression, and exploitation of people, so you may tirelessly work for justice, freedom, and peace among all people. May God bless you with the gift of tears to shed for those who suffer from pain, rejection, starvation, or the loss of all that they cherish, so that you may reach out your hand to comfort them and transform their pain into joy. Matt and his wife Joanna have two young daughters, Emery and Madisen. The Clays have been members of the Sheridan community since 2014. Matt enjoys writing devotions for Sheridan and serving in the OneSent Market.